Although stencil art has become recognized and accepted in recent years – mostly due to British artist Banksy – it has been present on the streets of world cities for years. 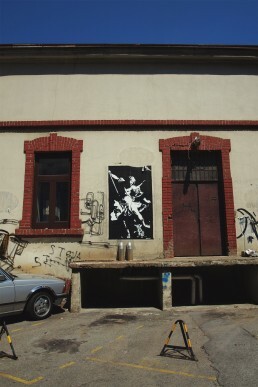 Blek le Rat, widely considered the Godfather of modern Street Art, was the first to use stencils for silhouettes in the street. 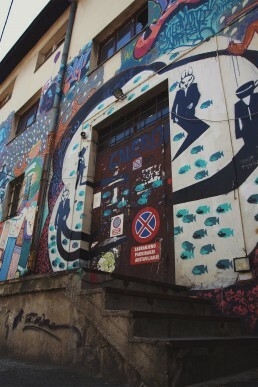 He has been investigating the urban space for over 28 years and continues to be a great inspiration for whole generations of artists who create in the public space. Since the early 80s, when he first came into contact with the New York graffiti scene, Blek Le Rat has created in the streets of Paris – later moving on to other cities of the world. 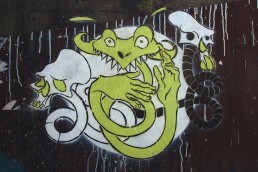 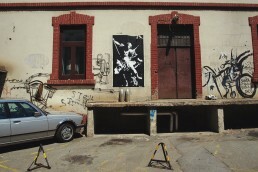 As part of BELEF in 2009, Blek Le Rat held a workshop and carried out several works in public space. My ninja friends Olgica, Vuk and I were fortunate enough to attend the workshop and have the opportunity to meet him and create some stencils of our own. The awesome black and white stencil in the photos below is Blek Le Rat’s work – located on the building across from the Cultural Center Magacin, where the workshop was held. 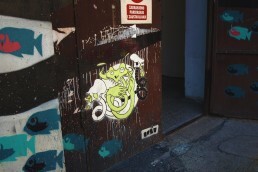 My little stencil can be seen on the entrance door. You can check out more of Blek Le Rat’s work on his official website and find out more about the Belgrade Summer Festival here.